Your institution is invited to participate in the 2018 Nebraska College Fairs. 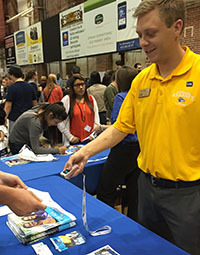 Thousands of Nebraska juniors, seniors, and their parents attend the fairs to find colleges that meet their needs. Complete the registration form before Friday, July 13 to be included in a college fair brochure that is distributed to Nebraska high schools. You may register after that date, but attendance will depend on space availability. Please share college fair policies with staff who will be attending the college fair. Barcode scanners are available to rent from College Fair Automation. I give EducationQuest permission to use photos taken of me during this event for its publications, social media, and website. To cancel your registration and receive a full refund, notify Nancy Price via email at least 30 days prior to the first fair you planned to attend. We appreciate advance notice if your representative is unable to attend an event. The college’s Director of Admission will be notified if a representative does not attend as planned. NOTE: The Nebraska College Fairs are brought to you by EducationQuest Foundation through partnerships with NACRAO and Nebraska high school counselors.